The new EcoSport facelift also changes a lot of the equipment package, along with a new exterior design. Ford India is reportedly gearing up to launch the facelifted EcoSport crossover in India, soon. The company intends to launch the upgraded version of the popular crossover around Diwali, and the new EcoSport is actually expected to come with a host of changes. In essence, the new EcoSport is not just a minor facelift, but is quite an overhaul in terms of the equipment package that it offers. The key change inside is an all new infotainment system, which finally does away with the very dated monochrome display strip and physical buttons in Ford Sync 2. The all new system will now host a touchscreen display, and the entire arrangement of buttons has been reworked. The instrument panel has also been upgraded, and you can also expected a newly designed steering wheel, with controls mounted on it. The new infotainment system will reportedly include Apple CarPlay and Android Auto, along with a rear-mounted camera with sensors for parking assist. Other technologies may include a navigation system, an electronic speed limiter, and even automatic climate control. All this will lead to a reorganised dashboard, and the dash will include body coloured plastic inserts to liven things up inside the cabin. In terms of drivetrain, Ford has debuted the new Dragon series engines that will power the crossover. The new engine will be a 1.5-litre, 3-cylinder petrol engine expected to produce upward of 115bhp, although the diesel engine will reportedly remain the same. 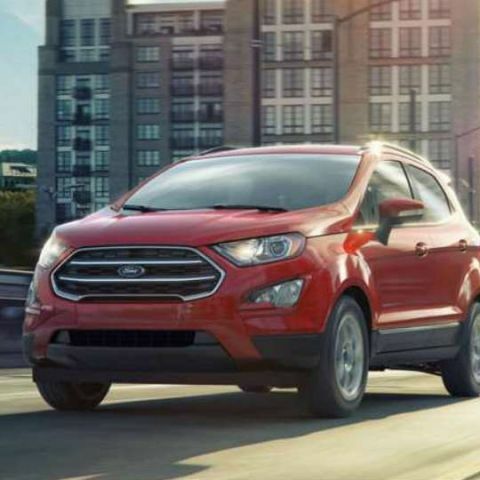 In terms of cosmetic upgrades, the facelifted EcoSport will get a new hexagonal grille, sharper headlamps, and a new design on the alloy wheels. While the international trim gets a concealed spare wheel, the India trim will still have the rear mounted spare. Which phone to buy with a budget of around 15000? increase sync interval of android ?